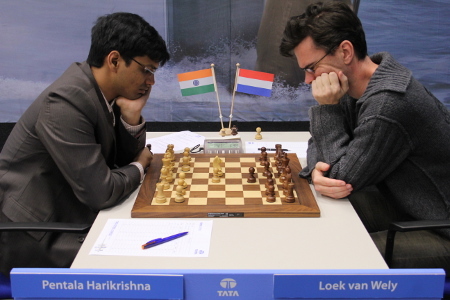 Here a recent effort(TWIC 950) from the just completed Tata Steel Group A tournament played by Harikrishna against Van Wely. White has a massive buildup on the kingside and after 28.Nf4, the big threat is Nxh5 with devastation on the h-file to follow. Both sides look like they are attacking each other but now white has the move. What do you suggest?